In light of the potential upcoming power shortages in Belgium, there are a lot of "tips" going around to save power during the cold months. One of them is to thaw out the ice in the deep freezer as, according to one of the power companies, a layer of ice one millimeter thick would increase power use by 5%. Is it true that the 1 mm of ice could increase power use by 5%, or that more energy is used by an iced-up freezer? In general, frosting has generally a negative effect on cooling. How much depends on the air flow in the freezer, as cold air has to reach every part of the contents easily. Water vapour deposited from the air leads to frost formation and has a great influence on heat transfer with the following positive factors. The heat transfer is further improved by the fact that the ice crystals in the beginning lead to an enlargement and more roughness of the surface. These advantages however are soon followed by the following disadvantages. 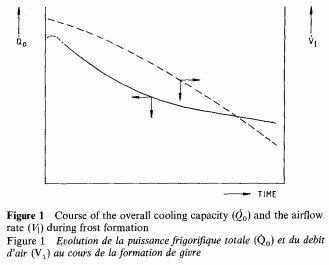 The poor heat conduction coefficient of the growing frost layer decreases the heat transfer. The evaporation temperature goes down or must be kept constant by a larger cooling surface. The frost formation reduces the air flow rate and enlarges the pressure drop. The air flow rate decreases fast or slowly, depending on the fan characteristic. This can result in too low an exit temperature and an undesired increase of the non-homogeneity of the air condition in the refrigerated area. The article further explains that there's an optimal frequency at which automated defrosting should happen: on one hand one would like to maximize the benefits of defrosting, but on the other automatic defrosting has a cost, because it slightly heats up the contents to remove the frost. While the authors refer to automatic defrosting, manual defrosting has even higher costs in terms of increasing temperature, because of course it means bringing the unit to room temperature. Does frosting decrease efficiency significantly? Yes, and the negative effect increases with time. Is regular defrosting a good practice? Yes. Is it possible to make a general statement that even 1mm of frost generates so-and-so costs? No, as the article shows, specific measurements are necessary to determine the exact effects of frost in a particular unit, and to determine when to apply defrosting in order to minimize cost. My personal take on the article is that defrosting once a year in winter is a good thing, but that the claimed efficiency losses are dubious. Not the answer you're looking for? Browse other questions tagged consumer-products electromagnetism energy-efficiency . Is there any proof that blackle.com conserves energy? Does leaving the fan on during an RV a/c cycle time save energy?